Elizabeth is a UK based Indian Entrepreneur. She was always fascinated by Indian culture. Given that the country has a diverse culture in its spree, Elizabeth was excited to bring those small facets of Indian culture to the global audience. She started a website named How to Visit India. The idea behind the site and social networking is to provide a platform and forum for advice, tips and travel guides on India in order to help travellers get the most out of the holiday or their journey in India. While interacting with these travellers, she noticed a fascination for Indian spiritual accessories. The travellers who usually visit India were always mesmerized with the range of accessories Indian people use for different purposes. These led her to open a store online, where she can offer an extensive range of Indian Spiritual accessories, making it easier for the Foreign people to buy their antique range of Indian Spiritual accessories which includes products like Mehendi (natural hair conditioner), Rudraksha mala (spiritual necklace), bindis (Indian forehead tattoo). Hankering over having an own webstore. Given that a substantial amount of her time was consumed by her current business ventures, hankering over having own store was looking difficult at that point of time. Also opening up one’s own store needs ample amount of marketing efforts and set-up capital. Elizabeth was looking for a quick set-up, where she can offer her products to Indians residing in UK or people who want to embrace the products for what they are. The marketplace strategy – Selling the products on eBay & Amazon. There are some significant advantages of selling products on online marketplaces like eBay & Amazon. The major benefit is, it helps small sellers to quickly gain reach and compete alongside with large sellers. According to Statista, Amazon draws 183 million monthly visitors, talking about eBay it draws nearly 68 million monthly visitors. Investing in a marketplace infrastructure was indeed a right decision for Elizabeth, as she was not only saving on the cost of developing an eCommerce website but getting exposure to a larger network of shoppers with minimal marketing efforts. With a quick setup system, she could easily add products & start selling instantly. While Amazon has the most efficient listing process, eBay is a platform where the Elizabeth can feature/promote her products well. Marketplace infrastructure comes with its own cons. Elizabeth was following a complex process of manually entering inventory & order information from eBay & Amazon. Her current inventory management system was time-consuming and prone to human errors. Elizabeth was also spending more time on the fulfillment process as she had to communicate the order information to her third party logistic provider (Royal Mail). She was looking for an Inventory Management system which can constantly sync new orders from Amazon & eBay and update the Inventory (stock levels) across all the channels, help her to overcome her fulfillment hassles, and give her an insight into the product & channel performance. Aggregating orders from different channel sources and syncing inventory across these channels was a major challenge. Elizabeth came across Orderhive for her inventory management & order management needs. Orderhive seamless integration with commerce channels like Amazon & eBay enabled her to fulfill more orders online, earn credibility on the platforms. Elizabeth is now one of the top rated sellers on Amazon and eBay. With Orderhive generated reports, Elizabeth can now take better decisions to streamline order and inventory process. Also, our detailed business insights help her predict inventory levels and eliminate the possibility of stock-outs. 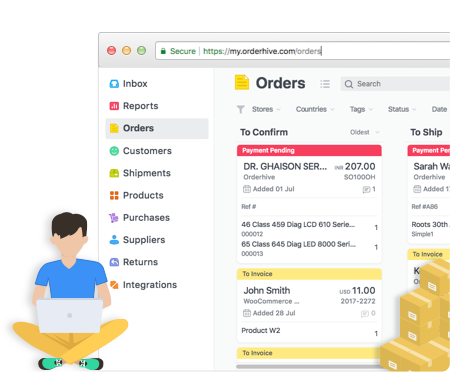 Orders get automatically synced in the Orderhive backend and the sales channels get updated with the relevant status change. Aggregating the order information from multiple channels & updating the inventory across these channels is not the only challenge when it comes multi-channel selling. Order Fulfillment was another milestone, where Elizabeth has to make sure that she is delivering orders to the right customer on time, and in the most cost-effective way. Elizabeth also had a need for a Mobile-based solution, so that she can access the order & inventory details from anywhere and can take appropriate actions on the go. Just like any other online seller, I was not a pro using a Multi-channel back-end system, but the team made sure that I can handle my system well. They just don’t provide me with the required training but were available 24/7 UK time to address my queries. After adopting Orderhive, KPBollystar managed to standardize their shipping process and unify their inventory across Amazon and eBay stores. Curious to see what KPBollystar has to offer? Check their stores on Amazon, eBay and their standalone website.